Cynar is now an Italian institution and was originally launched in 1952. The popularity of the drink grew steadily, but really took off in the 1960s thanks to a series of television adverts by esteemed film director Ernesto Calindri. Some of these have been re-created recently as part of a new advertising campaign. In 1995, the independent company that produces Cynar was purchased by the Campari Group and they have since grown the brand internationally. Cynar is now a market leader in both the 'digestif' and 'after dinner bitters' categories, as well as featuring in the world's Top 100 spirits for sales. 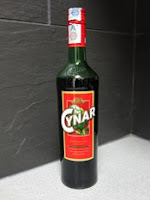 The main market for Cynar remains in Italy but it has significant sales in other countries, especially Brazil, France, Germany and Switzerland. The drink can be served in a number of ways - traditionally it is taken neat and this remains popular in Italy, but other ways include over ice, mixed with tonic, soda or orange juice and even mixed with beer in France! The colour of Cynar is a dark molasses brown, reminiscent of cola. The nose is aromatic and very herbal. There is initial sweetness but it is not long before a bitterness and the herbal notes take over. There are aromas of liquorice, molasses, cinnamon bark, vanilla pod, clove, mint and eucalyptus, with the overall feeling being earthy and very leafy. On the palate, this feels thick and mouth coating, with the distinct minty and eucalyptus notes hitting first before the more bitter molasses comes through. A great combination of characteristics then join the party - more liquorice, vanilla, slightly antiseptic cloves, green leafy herbs (imagine nettle and tarragon) and bitter raddichio leaves. Finally, there is some sweetness that is reminiscent of sugary black coffee. The artichoke element is really difficult to locate within all of this, but it must be contributing to the distinct leafy bitterness. The finish is very, very long and warming with the herbal bitterness grabbing the sides of your tongue and holding on. Most of the elements mentioned can still be identified some minutes later, especially the mint, raddichio and molasses. This is absolutely delicious and one of the best digestifs that we have tasted to date. The distinct bitterness will not be to everyone's taste but the bitterness is what makes it what it is. We sampled it neat and in the recommended small dose - it would be hard work to drink more than this, even after dinner as it is recommended. We now have to try it with the tonic, soda or orange juice to see how they effect the flavours. Lovely stuff.